This game is original and fun. All the players have a clear, perspex sheet and a felt pen. They have to look at a game map placed between them and trace a route on their sheet mirroring the map; avoiding hazards and grabbing power-ups. After 30 seconds each person’s sheet is placed over the map and their route checked; they gain and lose points depending on how their route did. And that’s it! You can mess around with other people’s go by gaining power-ups you can use to nobble them; forcing them to draw with their off-hand or making them hold their pen awkwardly for example. Quick to set-up and play and loads of fun. Godzilla, the game. Everyone picks a monster and you fight it out. Everyone roles a set of big, chunky dice and different sets of symbols give different effects. Claws do damage, hearts heal and numbers score points. You’re allowed two re-rolls of any number of dice to try and get what you want and the object is to get to the end of the game and score the most points. The big wrinkle is Tokyo itself; one monster can sit in there and any damage they deal is taken by ALL the other monsters but any damage dealt by the other monsters is only taken by the monster in Tokyo! There’s some power-ups you can get by spending energy (money) which mixes things up but that’s the gist of it. 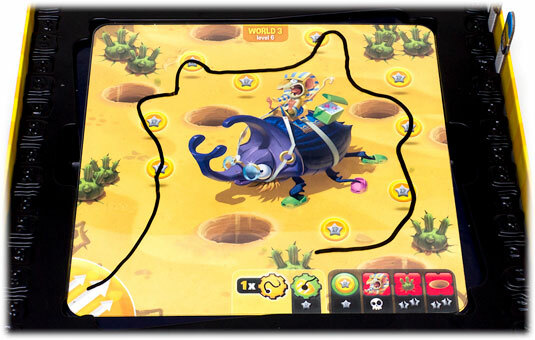 It’s great fun and smaller kids grab the dice-rolling and pattern matching easily while older ones can play the odds more and use power-ups to swap die-faces. But in the end it all comes down to Cyber-Bunny vs Mecha-Dragon! 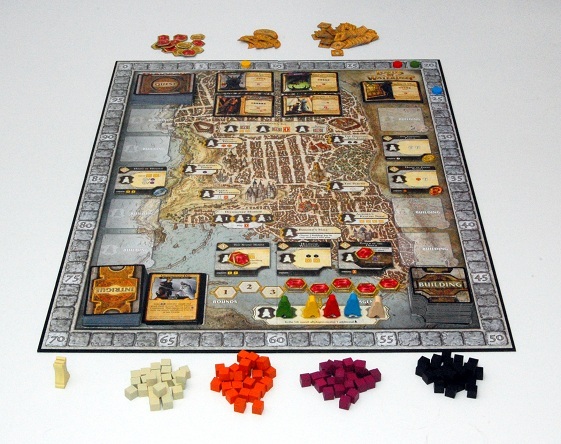 The theme for this game is very cool and is the main initial draw for children; the players are the secretive Lords of Waterdeep. They run the city, building it up and sending young adventurers out to do the work that keeps the city thriving. They also subtly act against each other to promote their own interests (every player’s bonus goal is secret until the end). It’s like a companies board of directors. If the CFO was a beholder. The mechanics are pretty simple; each player has a set of agents and they take turns putting them on the map. Each location on the map gives different benefits such as earning gold, recruiting adventurers or gaining quests and cards.The adventurers are represented by four different colour of cube (purple for wizards, black for rogues etc) and you send them out on quests to further your interests; basically “spending” them to turn in a quest card for points. In Seven Wonders each player picks an ancient city and through three ages they compete to see who can advance the furthest. For each age, the players each get a set of cards. On each turn they play one if they have enough resources (wood, stone, paper etc) shown in front of them to meet the requirements. Cards to generate more resources tend to be free to play, but don’t get you any victory points. Once everyone has played a card, all the players pass their hands round to the player to their left. 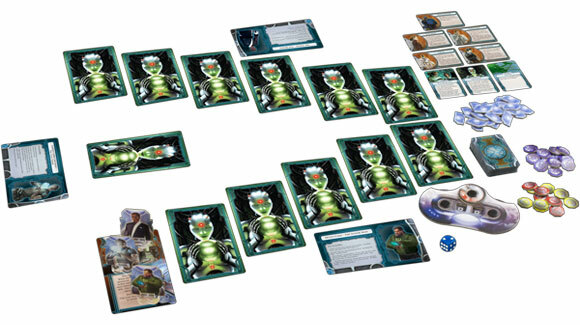 As the game moves into the second or third age the cards cost more resources to play. So this (and the hand movement) creates loads of interesting choices. Do I play a resource generating card now (skipping earning any points) so I’m more able to afford better cards later? Do I play a good card now or leave it in my hand and hope it’s still there when my hand of cards gets back to me? Should I build an army? Should I play a weaker card that ‘combos’ with other cards that I might get later? There’s hardly any text (it’s all symbols) so it’s nice an easy for children to pick up. It’s a great game; I’ve noticed my kids have started simply with the game but have moved on to more subtly strategies as they’ve learned the game and grown up. The final tally of victory points is only counted at the end so there’s always room for surprises! Turbo-Snap. 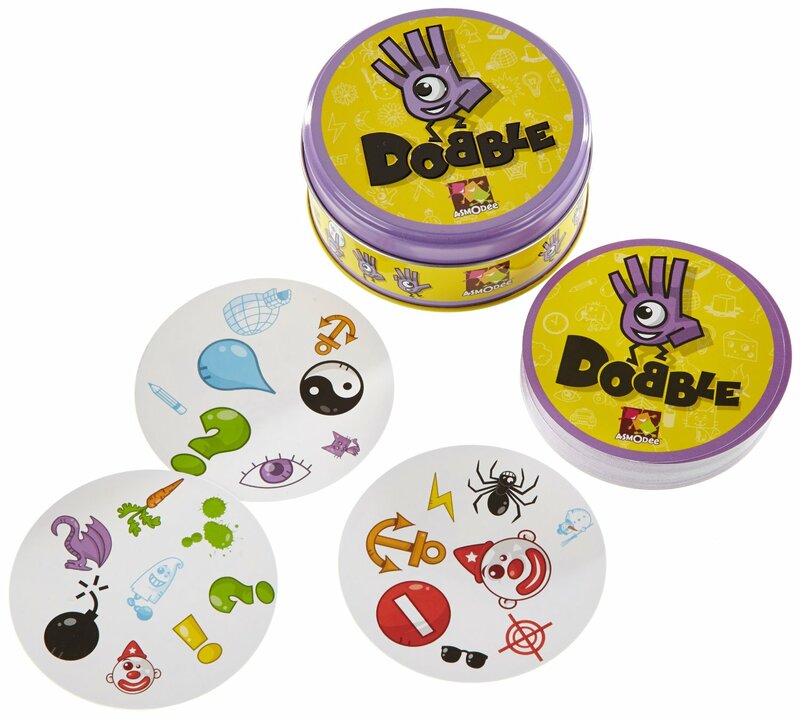 Dobble is a set of circular cards, each with loads of symbols on. Which symbols are on which card varies as does the size and orientation of each symbol. The first game you learn has a pile of cards in the centre and each player has a card face down in front of them. When the game starts, everyone turns their card over. If someone sees a symbol on their card that has a matching symbol on the card at the top of the pile they call out the name of the symbol and take the card. That goes on the top of their current card and the process repeats. It’s surprisingly tricky and gets pretty tense. In your haste to get in first you’ll call out all sorts of bizarre nonsense but you can easily get streaks if you get your eye in (or if the same symbol is on multiple cards in a row). Mature Themes? : You’re robbing a corporation in a cyber-punk future; lots of dystopian imagery. Assassins, Thieves and Cyborgs, oh my! Fancy a spot of cyber-punk larceny? In Infiltration you break into a corporate HQ constructed randomly from a set of room tiles. On each turn you can advance a room, retreat a room, use a piece of equipment or loot the current room in multiple ways but the tricky part is that each player chooses their action secretly and reveals them together. Of course, the actions all have downsides; Moving forward gets you away from the other players but means you don’t get any money that turn; breaking the security in your current room opens all the money in the room for theft but means the person next to you will get the chance to loot it; choosing to rob the room is risky as you rely on someone else breaking the security before you (if everyone else decides to move on you’ve wasted your go). You can mess with each other a little but the real enemy is the alarm. It ticks up a random amount on each players turn and when it hits the maximum, everyone still in the building loses. Again, you can guess roughly how long you still have but player cards, room reveals and dice rolls can all skew it suddenly. Do you go deeper into the building for better rewards, risking not being able to get back out in time? Finally, your ill-gotten gains are in the form of money tokens whose value is kept secret until the end; you don’t know who’s winning until the end of the game (though you can have a plausible guess). It’s a brilliant game; we’ve had a few when someone’s played it safe and left early and then the other player’s are desperately running to the exit as the final alarm score ticks. 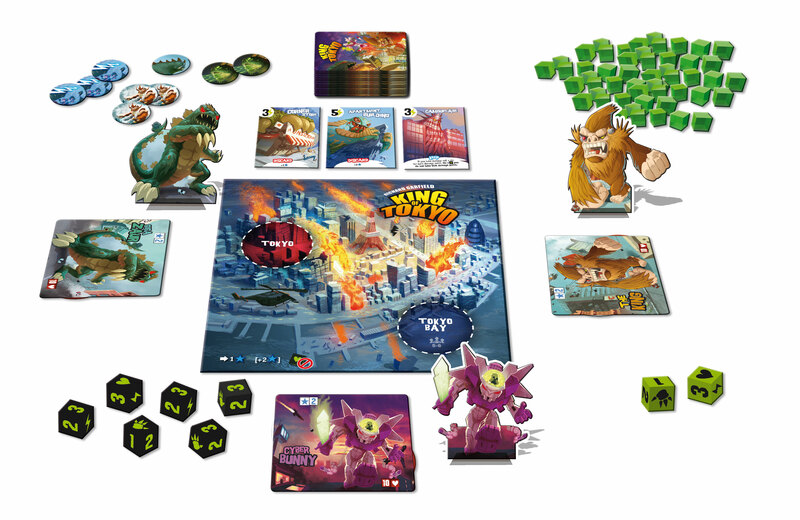 The games have been totally changed by the final dice rolls or someone playing a card to spike the alarm forward 10 points just as they leave. Very cool.